I have a CrossPlattform App and did not test the other plattforms, only UWP yet. Windows 10 with Xamarin Forms 3.1.0.697729 which was the one installed for CrossPlattform. After returning from Page A (with "PopModalAsync") should NOT show up Page B but the new Page C instead. None of the both worked as expected. Both are terminating with an "System.ArgumentException". I have no idea how to solve that issue. The first solution would be better, because of the events triggered are more similar, but I could solve it the second way. Before using the Page-Structur shown above, I did not use the NavigationPage. I added it only because of other Exceptions, which told me it's imposible using InsertBeforePage or RemovePage with other pages than NavigationPage. Nachricht = Index was out of range. Must be non-negative and less than the size of the collection. After looking at the details, it becomes more clear. The ModalStack is empty after insertPageBefore, but the normal stack have the two pages as i wanted them to be. where ZZZZContentpage inherits now from NavigationPage and is my Page C, the other Page A.
has the advantage of not crashing! But both stacks are now empty at the end of the pop-method, which is not as expected and the window A is still showing. Even if Windows C would show up correctly as expected there would remain the problem that I could not use PopModalAsync to leave from page C, what I normally do. May be, the use of "Modal" is not necessary at all. I never understood the difference well. How should the user change back to an other page above in the stack, if the pages are all "Fullscreen" and there are no Buttons to change Pages without that i am offering and the "back" button which is ever there. Changing all away from "Modal" is some more trial to solve the issue. May be I have to make it. Thank you in advance for any hints or suggestions. @Mitch8765 I mean all your pages should be embedded in a Navigation stack, then you can use PushAsync and PopAsync API to show or dismiss pages. I guess maybe you used a PushModalAsync to show your page A, then page A wasn't in a Navigation Stack. So InsertPageBefore failed. I created a simple sample here, you can refer to it for detailed code. It appears that rather than just inserting a page in the navigation stack, you are actually wanting to change the app's main page. I suggest investigating App.Current.MainPage = new NavigationPage(A); in place of InsertPageBefore. This code will not throw error messages, because A has been placed in a Navigation Stack. But as you mentioned above, pop API seems useless. Because Navigation Page P isn't shown on your current window, your code makes no sense. @LandLu - I had a look at the documentation on docs.microsoft.com at the weekend to see what it said about InsertPageBefore. 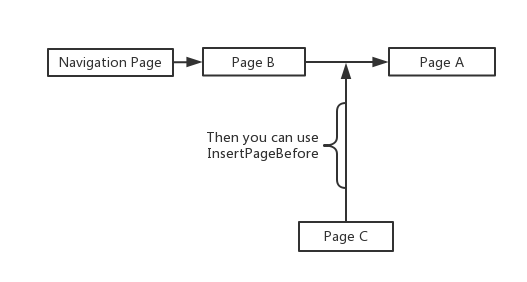 I've always assumed that InsertPageBefore only works on the NavigationStack and not on modal pages, but found nothing in the documentation at the weekend to confirm that. Even looking at the XF source code, there are no comments to say whether InsertPageBefore can or cannot handle modal pages. It might be worth clarifying the documentation to make it explicit what can and cannot be done with InsertPageBefore. Having said all that, I don't think that @Mitch8765 actually needs to use InsertPageBefore based on the posts above. Changing App.Current.MainPage should do what has been asked for. @JohnHardman: I tried that with changing the currentWindow. It seemed to me, that after doing that, the underlying Navigation Stack did not react as before. I am relatively new with Xamarin and in that moment I had not figured out viewing the Stack like at the end. I think it was empty after changing the currentWindow. But at the end it did not work. May be because I use only the ModalStack. @LandLu all the articles you mention I have read already. They all do only the very simple stuff. The Picture you showed me, I do not understand. What does it mean in code? The logic is clear, the structure of pages not. I use a framework which is constructing my pages in an abstract manner. The pages could not have dependencies from one to an other. They must be independent from each other and the connection has to come with the Navigation Stack at run time. The framework (now) constructs each page with his own NavigationPage as top of the logical structure. They are building together a complex form of flexible and varying Master-Details-Master-Details connections. The user can navigate freely from one object (Master) to the other depending on the logical network between the different object types. My suspicion, in the absence of good documentation, is that the easiest thing may be to not use a modal for the last page pushed. The transition when pushing a modal page on top of a non-modal page has an unexpected effect on the NavigationStack (both I and others have mentioned that in other threads). If the transition on pushing is unexpected, what happens if using InsertPageBefore after such a transition is anybody's guess. Unless you have time to investigate thoroughly, avoiding the modal is probably the easiest thing to do. Really the documentation should avoid such issues. The distinction between those both methods (push and pushmodal) in relation to InsertPageBefore is never made. Maybe you could add some clarification, that there are two different stacks which operate separately. I noticed that first time while going into the internals of the implementation. It was invisible (for me) in the documentation. For me in all the documentation exists only ONE Navigation Stack, never read about two. And it could be so, even when the implementation (I found during debugging) works technical with two stacks. The implementation could handle that, but as you told me now, it does not. One of both has to change, implementation or documentation.